Sostre has won championships in all the major one-wall competitions. Robert Sostre's name will not be recognized by the average sports fan. He doesn't appear on TV, have endorsement contracts, or command a large salary. But in the world of one-wall sports (paddleball and handball) he is a star performer. He toils in relative anonymity cashing in modest paychecks for winning performances. But that's only because one-wall is played limited primarily to NYC and the surrounding areas. If this wasn't the case Rob's name would be as well known along with many of the other great athletes. Sostre first burst onto the sports scene, barely in his teens in a paddleball tournament. His immense potential was recognized at an early age. Rob dominated the yearly Budweiser sponsored events to such a point that they could have been renamed the Robert Sostre Invitational. Paddleball alone couldn't contain or satisfy his tremendous physical talents, energy and enthusiasm. Many paddleball players have attempted to play handball. Only Joel Davidson, who at the tender age of 17 won the AAU One-Wall National Handball Singles Championship, has come close to Rob's success. Unfortunately, for the one-wall community, Davidson went off to college and stopped playing. Sostre is still going strong after more than a decade. He already has 4 USHA National One-Wall Handball titles (2 in doubles with Al Torres and 2 in singles). One of Rob's greatest performances came in the 2002 NYC Citywide Big Blue Championships. 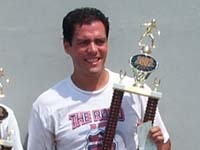 One the final day, Sostre beat Ray Lopez, who had become the "favorite" after an injury contributed to the defeat of the '99, '00 and '01 champion John "Rookie" Wright. In the semi finals, Emmitt Fitzpatrick fell 21-19. Then in a stirring performance that will be remembered for years, Rob overcame a 14-20 deficit and an groin pull to defeat George "Lefty George" Figueroa 21-20. His personality is equally as impressive as his talent. On the court Rob is all business. No trash talking or boasting. Sostre complements opponents on nice shots and even makes calls against himself (I think I once did that twenty years ago). I consider him a role model for today's players. Had someone placed a tennis racquet in his hand, Rob might have made it to Wimbledon. Tennis' loss was one-wall's gain.